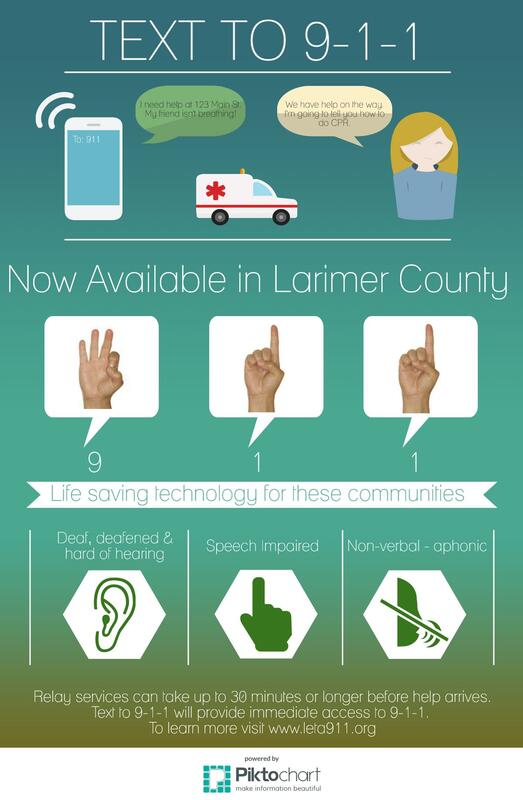 In the summer of 2014 Larimer County introduced Text-to-9-1-1 service in all communities within the county. Text-to-9-1-1 is supported by all five PSAPs (Public Safety Answering Points) which are the Larimer County Sheriff’s Office, Fort Collins 911, Colorado State University Police Department, Loveland Police Department and Estes Park Police Department. Text to 9-1-1 refers to the ability to send text messages to local 9-1-1 call centers during an emergency. All dispatch centers in Larimer County are currently equipped to receive and handle text-to-9-1-1 calls. The caller is in a remote location and can only send out a text message. Phone lines and cell phone towers are overwhelmed and only a text can get through. How do I text 9-1-1? Once you have initiated a text-to-9-1-1 conversation, do not delete the message or turn off your phone until the dispatcher tells you it is ok. Call centers can only receive and reply to text 9-1-1 calls and cannot initiate a text message conversation without the caller texting 9-1-1 first. Currently, Verizon Wireless, AT&T, Sprint, T-Mobile, Cricket Wireless, Union Telephone Company, Comcast and Viaero Wireless have agreed to offer the Text to 9-1-1 service. Several other Tier 2 carriers also support text to 9-1-1. Can I text 9-1-1 outside of Larimer County? If you send a text message to 9-1-1 outside of Larimer County and that area does not currently receive text messages, you will receive a message indicating that texting 9-1-1 is not available and you should make a voice call to 9-1-1. Can I text 9-1-1 from my free texting application? Some over the top applications may support text-to-9-1-1, but not all of them do. I have a video or picture of a crime in progress. Can I send that to 9-1-1? No, photos and videos cannot be sent to 9-1-1 at this time. If I am able to text 9-1-1, will the 9-1-1 call center automatically know my location? When you make a voice call to 9-1-1, the call taker will typically receive your phone number and your approximate location automatically. This is called “Enhanced 9-1-1” or “E9-1-1.” However, when you text 9-1-1 from a wireless phone, the call taker will not receive this automated information. For this reason, if you send a text message to 9-1-1, it is important to give the 9-1-1 call taker an accurate address or location as quickly as possible. I don’t live in Larimer County, is text-to-9-1-1 available in other areas? Many areas of Colorado are now able to accept text-to-9-1-1. The FCC maintains a master list of PSAPs, nationwide that are ready for text-to-9-1-1. You can download the list directly from the FCC Website.